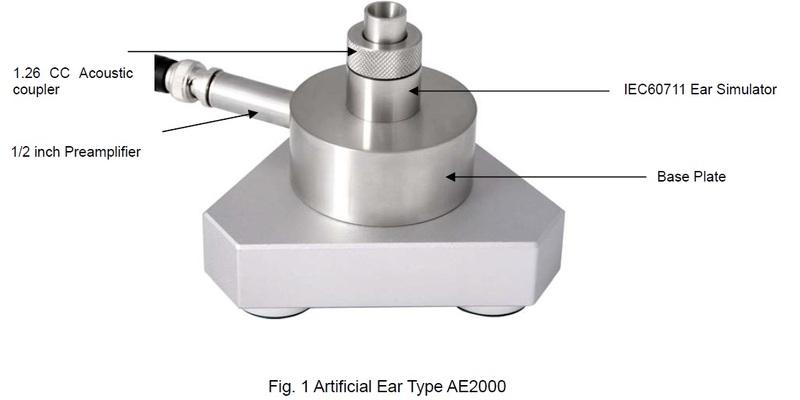 The Artificial Ear Type AE2000 is a complete test jig for acoustical measurement on earphones coupled to the ear by inserts such as tubes and ear moulds. Artificial Ears Type AE2000 consist of an acoustic coupler, RST condenser microphone and preamplifier and a base plate, which all parts are made of stainless steel and no any magnetic material. Artificial Ear Type AE2000 fulfils the requirements of IEC 60711 and is defined for simulating the acoustical load of the human ear under no leakage conditions. The coupler fits 1/2 inch Microphone and 1/2 inch Microphone Preamplifier mounted in the hous­ing. The coupler also mounts directly on the preamplifiers by the Adaptor Ring supplied.